Founded in 1996, Crux Books was created to offer students affordable new and used Christian theological books by offering discounted prices. Starting from a storage closet in the late nineties, Crux moved into its first manageable space in 1999. 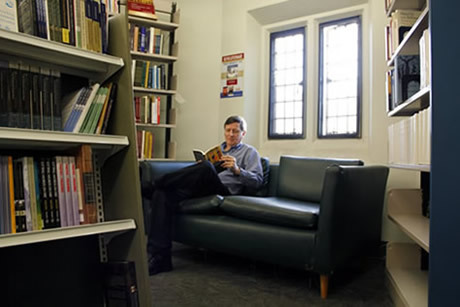 After 3 years in this ample, but small, room in the basement of Wycliffe College, our founder Pat Paas decided that a new location was needed. The search ended when the libraries of Wycliffe and Trinity College were combined leaving a vacancy in the space previously occupied by the Wycliffe College library. After a few months of cleaning, re-carpeting, painting and the application of new shelving the new space was opened in the summer of 2002. Crux Books began to thrive in this new location, quickly building a larger and more diverse customer base as the space allowed for a greater diversity of titles and selection. This new location was also the first home to the new beverage cafe offering gourmet coffees and teas as well as fresh hot chocolate. This expansion then required additional staff, thus providing needed part-time jobs to students… which we continue to this day. The fall of 2003 saw the most significant change in the Crux Books history: the integration of a real-time, fully automated computer inventory and sales system. This new system, BookManager, made it possible for Crux Books to finally have a searchable inventory that is automatically updated as sales happen and new orders are received. This system also allows our employees to offer much more accurate estimates on special book order arrival time and prices. In 2009, the Crux Books founder Pat Paas tragically died. This was a great loss that was felt by the store and by so many of those whose lives Pat had ministered to, and touched so profoundly, over the years. In 2010 Crux Books was purchased by Edward & Cindy Hayley, our current owners. Prior to Pat’s death, Cindy had worked for Pat for a number of years and is our current General Manager. Edward is a graduate of Wycliffe College and is the current Business Manager. We proudly continue the vision and mission of Crux that Pat started so many years ago. In the past few years we have expanded our business to include hosting of book launches, and providing book tables for the many Christian conferences and events in our surrounding area. We now also sell Christian greeting cards from DaySpring and Printery House, along with journals and church calendars. We have also expanded our book inventory to include unique publishers such as The Institute of Carmelite Studies, Tan Books, Matthias Media, Herald Press and Midwest Theological Forum, to name a few. At Crux Books you will also find a good selection of Taize music and songbooks, as well as books about the Taize and Iona communities. Today we continue to hear so many positive comments from people who discover us, many who marvel at our incredibly diverse selection of theological resources. 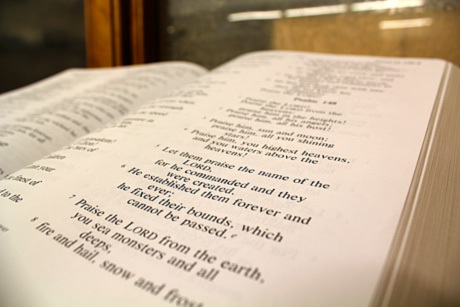 Since we provide textbooks for all 7 of the Toronto School of Theology Colleges at the University of Toronto, along with the Toronto Baptist Seminary and the Institute of Christian Studies, our inventory spans a wide range of denominations. We also sell our diverse resources to all in ministry, to churches and libraries, and to laypeople. We carry a huge selection of rare and used books, and often fill orders on difficult to find books. Crux Books is still located in the same premises it moved into in 2002. Conveniently located in the heart of the University of Toronto campus, in Wycliffe College, our main entrance can be accessed directly from Tower Road, just north of Hart House. For those unfamiliar with this area of Toronto, we are close to the Queens Park Circle, one block south of Bloor Street. We still offer you the same great prices Crux has been known for, and a place where you can browse and see what you want before you make a final decision to buy. Come in and enjoy our cozy atmosphere, our friendly and helpful staff, and our great refreshments. Today we offer fair trade coffee (freshly ground and brewed at Crux), tea, hot chocolate, and French vanilla… also all at discounted prices. Still being owned and operated as an independent Christian business, we see this as our ministry to you and work very hard at providing you with the books and resources you need to do your ministry. We’d love to see you soon. If you can’t make it into the store, visit us online. You can order online, as we ship within Canada and the US as well as many other countries in the world.